Buy Pre-Tupping + Post Lambing Drench From Osmonds. A highly concentrated Vitamin, Trace Element and Chelated Mineral Supplement for sheep and goats. Specifically formulated to help improve condition prior to tupping, thus increasing fertilisation and ovulation rate, and helping to produce healthy, well developed offspring by ensuring vitamins and minerals are available at the correct levels. Formulated on an emulsified base, providing a fast and efficient route for administration and absorption, providing good palatability and easy acceptance. 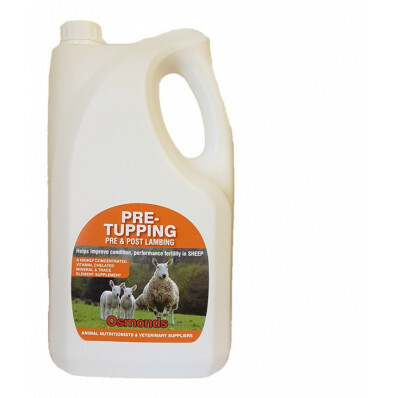 By including all round higher levels of nutrients than similar products and reccommending drenching every 4-6 weeks Pre-Tupping may help to maintain the wellbeing of ewes, lambs and tups, thus ensuring optimum performance. Formulated to help tighten the lambing period.